Today I'm sharing ideas for using Hooray for Hat! by Brian Won as a mentor text. I love the mix of colors in Hooray for Hat! As we were reading this book, I started to think about Jon Klassen's I Want My Hat Back. This is obviously a totally, completely, way different story but the animals walking up and talking to each other made me think of the bear asking each of the animals for help in I Want My Hat Back. Experiences like this with books makes me realize how reading lots of books makes it possible to make connections between books and to compare text to text. Whenever my students struggled with these skills, I knew it was because they needed to read more books. 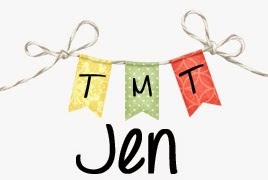 They needed more exposure to stories and someone to talk to about stories so that they could start to think more about how stories connect and are similar. 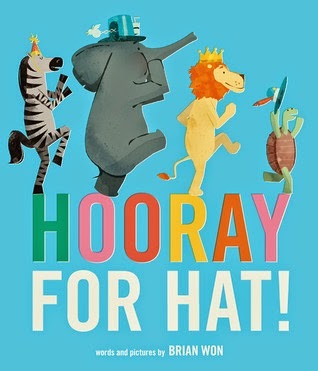 Here are some literacy ideas to go along with Hooray for Hat! by Brian Won! 1. I'm not sure how you can read this book and not immediately think Readers' Theater. I mean, this book just begs to be acted out. You can tell from our picture that we were so excited to gather up hats and pile them up on top of our heads! Here's what I would suggest to do to extend this activity. What about asking kids to practice their speaking skills before the performance? The dialogue in this book is perfect for practicing fluency and reading with intonation and expression. Students can record themselves reading their parts and listen back and do a self-assessment to decide how they did. Students can listen to each other read the different parts and even offer feedback to each other. 2. As a mentor text for inspiring students to write, this book is great because most of the characters seem to be in a bit of a funk. The story doesn't really address exactly why any of them are grumpy but it does show them how to let go of their unhappiness. 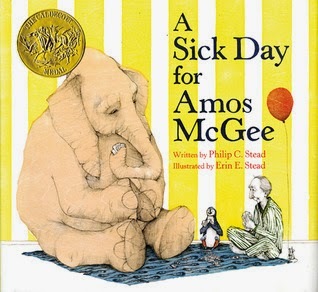 I nudged Peanut as we read because he had just been cranky not long before we read this. It's totally okay to get upset sometimes but I think it's important to talk to kids about how to handle emotions and/or what we can do if we someone else who needs some cheering up. 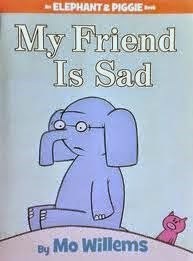 This book can be the start of a conversation about emotions and about how sometimes we feel upset or cranky but knowing that we can turn to a friend is a great way to deal with those emotions. After reading and discussing how the characters in Hooray for Hat! helped each other, kids can start to think of their own stories of feeling grumpy or cranky or down in the dumps and share what helped them feel better. All three of these books are favorites when it comes to talking about feelings. We had a chapter book party last winter and the kids absolutely loved reading and acting out different Elephant and Piggie books. They are amazing for Readers' Theater! My Many Colored Days is a book I discovered in college and I love that it's written but Dr. Seuss but that the illustrations aren't done by him. It actually wasn't published until after he died. He had hoped that the artwork would drive this book and I think the illustrators did a great job. 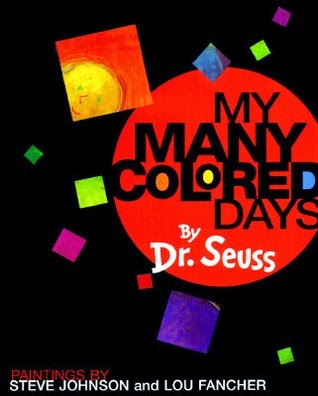 When I think about comparing different texts, this would be a neat one for looking at colors but also for comparing with other books that are illustrated by Dr. Seuss.